Our new scorecard was released today, finding that most insurers are still failing to take action on coal to prevent dangerous climate change. Leading insurance companies have pulled $20 billion out of investments in coal and a growing number are refusing to underwrite new coal projects, reveals a new scorecard on the industry from the Unfriend Coal campaign. Zurich announced this week that it will divest from and cease offering insurance to companies which depend on coal for more than 50% of their business. It now has some of the strongest policies on the scorecard, which rates 25 of the world’s biggest insurers on their action on coal and climate change. Swiss Re and Lloyd’s have also informed Unfriend Coal that they will announce new policies in the coming months. 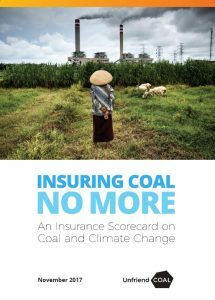 In all, 15 insurers with over $4 trillion in assets have now taken or are planning action on coal, divesting an estimated $20 billion in equities and bonds or ceasing to underwrite projects, finds Insuring Coal No More: An Insurance Scorecard on Coal and Climate Change. But although the shift away from coal is growing, these early movers still need to do more, and most insurers have yet to do anything to prevent the risk of dangerous climate change. 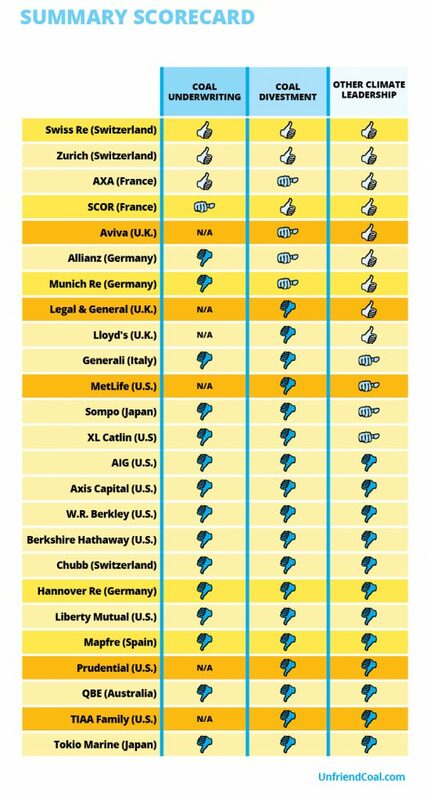 The scorecard finds that no U.S. insurer has taken meaningful action, nor have major European companies such as Generali, Hannover Re, Chubb and Mapfre. 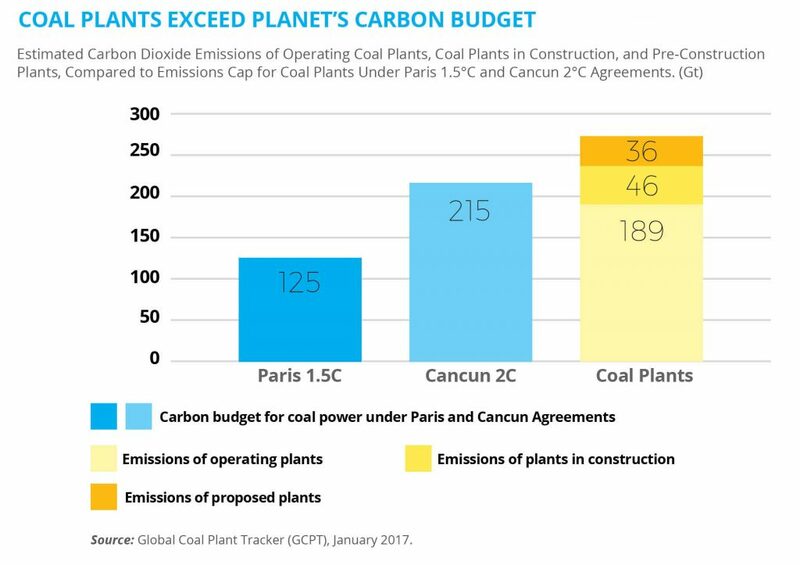 Coal is the biggest single source of CO2 emissions and insurers are uniquely placed to support the Paris Agreement commitment to keep climate change well below 2 degrees Celsius. See our full report for detailed scorecard. In its annual review of global action on climate change, the UN recently called for a stop to new coal power plants and an accelerated phase-out of existing plants as key steps to achieving international climate goals. 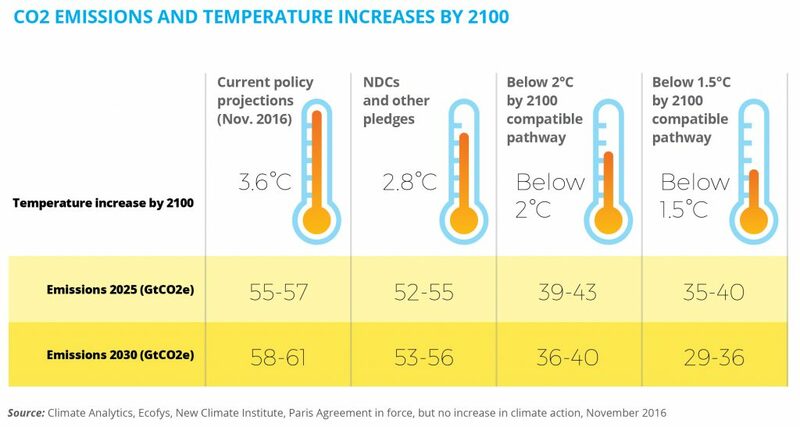 The International Energy Agency’s pathway for a 2 degree transition also requires 99% of global coal generation to be phased out by 2050. AXA was the first global financial institution to shun investments in coal in 2015 but has since been overtaken by insurers that apply stricter criteria. In April this year AXA also became the first insurance company to announce that it would no longer underwrite coal projects. The Unfriend Coal campaign is an initiative by 13 international civil society organisations to hold insurers to account for their action and inaction on climate change. In June 2017 the organisations wrote to 25 of the largest direct insurers, life insurers and reinsurers, calling on them to take action on coal and asking for details of their policies. The Scorecard is based on responses from 17 companies – including four from CEOs – and information from industry surveys, company literature and websites for all 25. It rates insurers on a number of criteria including the following. Underwriting – Zurich and AXA score highly for using a broad definition of coal companies that includes new and existing mines, and they are ending coverage to mining or electricity companies that derive more than 50% of their turnover from coal. Swiss Re has already limited its underwriting of shale gas, tar sands and Arctic drilling projects and, as part of a broader carbon risk steering mechanism, is currently preparing a policy that will limit its business support for thermal coal utilities and mining. SCOR’s policy only covers lignite plants and new coal mines. Unfriend Coal is calling on insurers to adopt a tighter 30% threshold for action and apply it to all types of insurance for all thermal coal. Divestment – Zurich and AXA score highly for divesting both their own assets and assets they manage on behalf of third parties from mining or electricity companies that derive more than 50% of their turnover from coal. Swiss Re and SCOR use a tighter 30% threshold and manage little or no third-party assets. Allianz has adopted a tighter 30% threshold but this does not include more than $1 trillion of assets it manages for third parties. Munich Re has divested from equities but continues to hold coal company bonds. A 50% threshold allows continued investments in some of the world’s most aggressive coal developers, such as Korea’s KEPCO, Japan’s J-Power and Malaysia’s Tenaga. Unfriend Coal is calling on companies to adopt a 30% threshold for their own and third-party assets for equities and bonds. Other Climate Leadership – Climate leaders take the initiative to promote climate solutions, for example, through cutting edge research or sustained advocacy for strong, binding climate legislation. 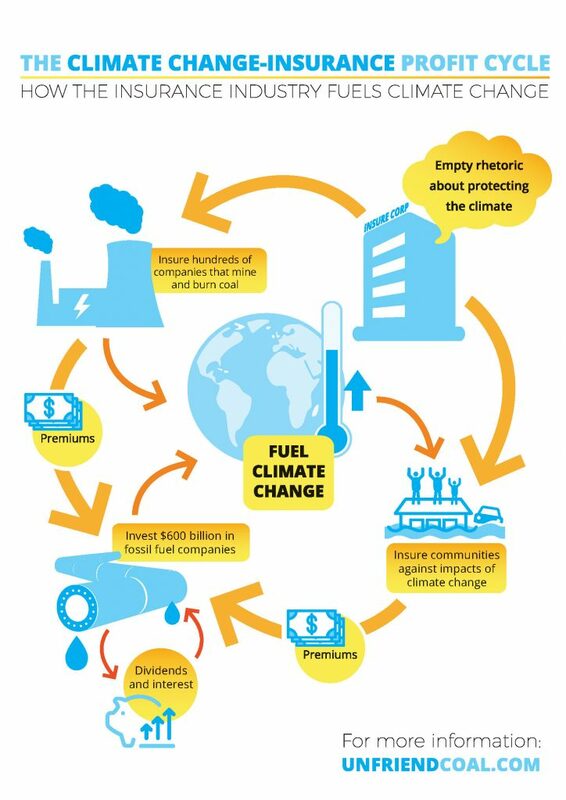 Some insurers show genuine climate leadership but have not matched it with action on coal. The full report and scorecard is available to download here. 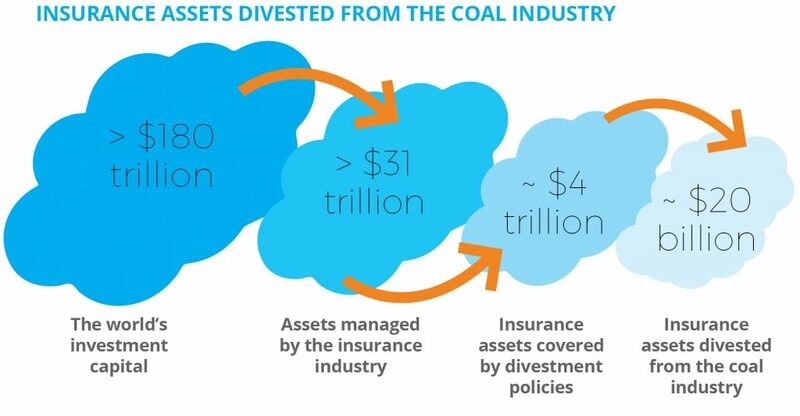 Insurance assets divested from the coal industry. 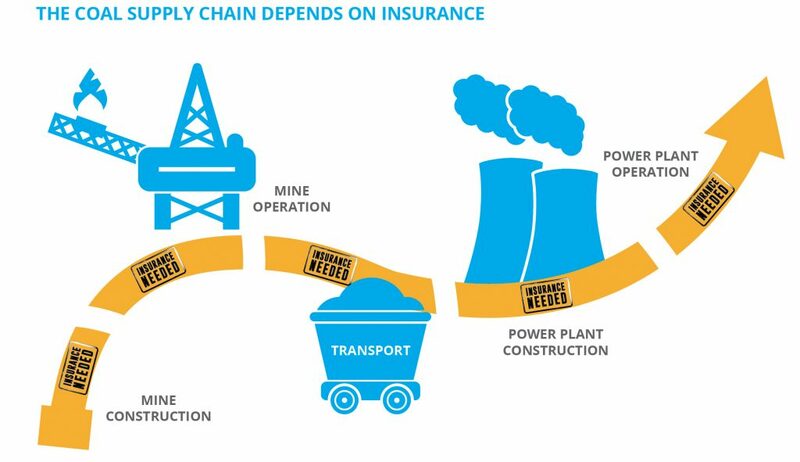 The coal supply chain depends on insurance. Coal plants exceed planet’s carbon budget.